Ma Hnin Phyu shows the purse she made. 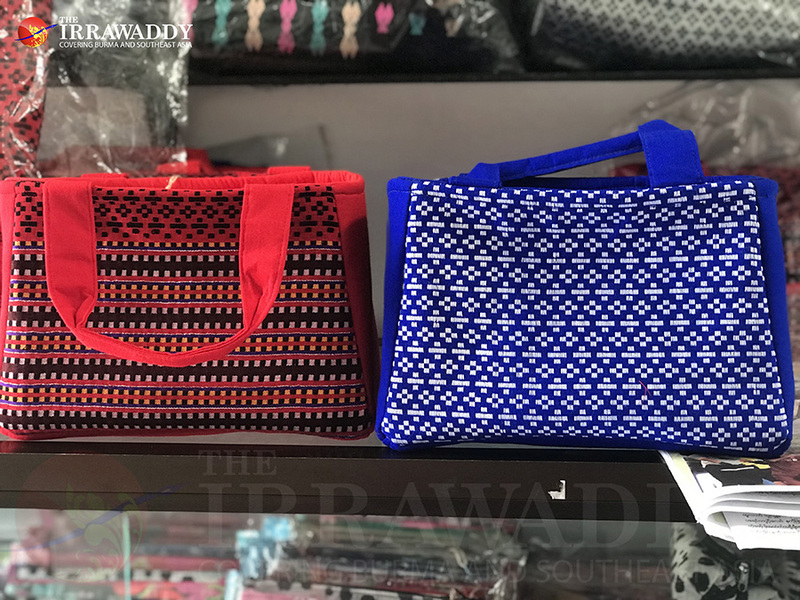 YWARLUT, Bilu Island, Mon State – Handmade cloth bags featuring ethnic-inspired patterns are becoming popular with local women who love the traditional fabrics. One of the few women to have started a successful home business out of a love for making the bags is Ma Hnin Phyu. Her small business also provides jobs for local women in her community, who have skills but for a number of reasons could not leave their homes in Ywarlut Village, Chaung Zon Township on Bilu Island in Mon State. This emerging woman entrepreneur’s story began with her love for the bags in their many different styles as well as a love of designing them. “I want other people to enjoy them as much as I do, so I started the business,” she said. With the help of her mother and friends she began the home business, which now provides local women with jobs, while also supporting female weavers of traditional clothing in Mon and Karen states. 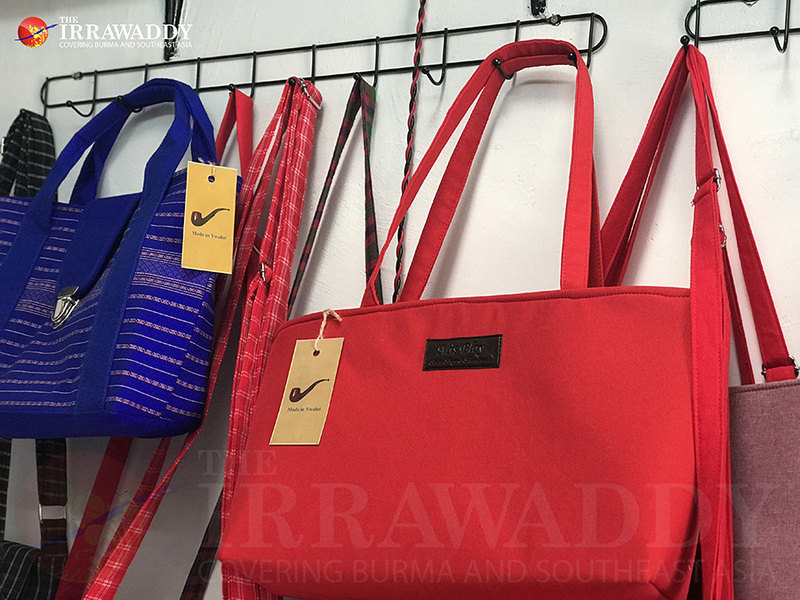 “When I first started, people loved my bag designs, so I kept doing it and the business got bigger,” Ma Hnin Phyu, 28, told The Irrawaddy. 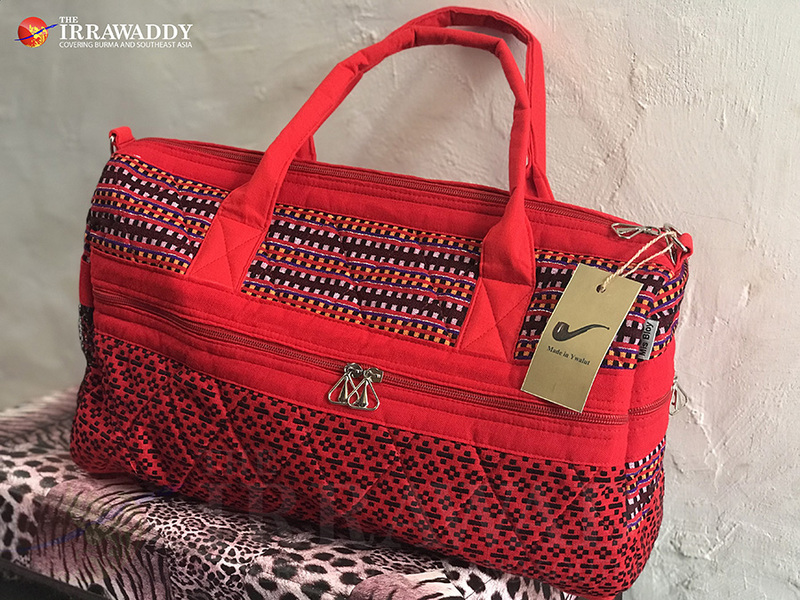 Travel bag made with traditional Mon longyi fabric. Ma Hnin Phyu first learnt how to make bags with a teacher from the office of the Mon Women’s Organization eight years ago. 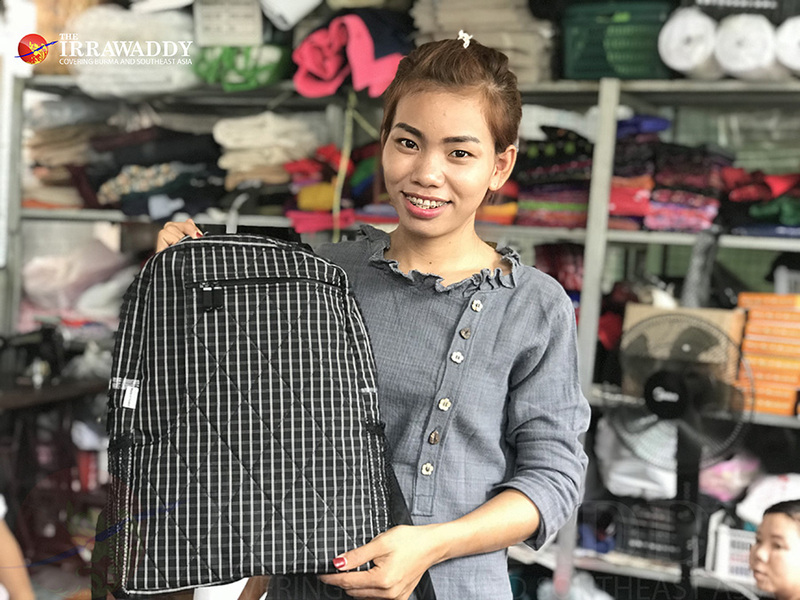 But she did not venture into making bags commercially until a year ago, after she had trained with a professional bag-tailor in Yangon to hone her skills. It was then that she felt ready to create her own designs using the traditional patterns. She markets her products under the “Mis Bloy” brand, which means “the pearl”, and proudly labels them “Made in Ywarlut” under an image of a smoking pipe. Ywarlut is famous for its pipe-making on Bilu Island, a popular tourist attraction in Mon State. Shoulder bag made from cotton. “She has the potential to be successful as her ambition is high and she wants to expand the business,” said Daw Cherry Shein, the Yangon trainer who coached Ma Hnin Phyu in bag-making with traditional cloth. “The cloth bags made with traditional Chin, Mon, Kachin and Karen fabrics are getting more and more popular these days,” said Daw Cherry Shein, who has been creating cloth bags for more than two decades. She added that it is not only foreigners who love the bags but also local women, who are starting to match the traditional cloth bags with their dresses. Daw Cherry Shein provides training on both a paid and voluntary basis. She said Ma Hnin Phyu was one of only a few of her students who had the potential to make something more than a hobby out of a love for the bags. Handbag made with Mon traditional (women’s) longyi fabrics. Mis Bloy cloth bags are handmade in a small workshop that is filled with traditional Mon fabrics – usually used for longyis (sarongs) for both men and women — and customers can order by choosing the colors, patterns and design, or they can simply buy finished products at a shop in Ywarlut or by ordering them through the company’s Facebook page. Schoolbag made with traditional Mon cloth (men’s longyi). Mis Bloy also takes orders to make bags based on other ethnic designs such as Karen, Kachin or Chin for other brands as well. In the beginning, Ma Hnin Phyu took individual orders from each customer. It took time to create the unique designs and she was not able to produce many bags. It was also an expensive way to do business. “Then I decided to make many bags available with several designs so that the customers could choose from them,” she said. Mis Bloy products are distributed to shops in Moulmein, Thanphyuzayet and Ye townships in Mon State, as well as to Paan, the capital of Karen State, and to stores in Yangon.